Born August 2, 1915 in Farrell, PA. An accomplished amateur fighter (176 bouts, 170 wins), Soose was a three-time Golden Gloves champion and a U.S. amateur champion. He earned a scholarship to box at Penn State, going undefeated in two years (17-0, 17 KOs) and capturing the 1937 national intercollegiate title. So dominant was Soose, boxing officials passed a law barring winners of Golden Gloves tournaments from intercollegiate boxing, effectively ending his college career. Soose turned pro in 1938 under the managerial eye of Paul Moss. A superb boxer with a sharp left jab, the savvy Soose began his march to the world middleweight title. Wins over Babe Risko (KO 3), Paul Pirrone (W 6), Tami Mauriello (W 10) and non-title bouts with NYSAC recognized champ Ken Overlin (W 10) and NBA champion Tony Zale (W10) had many calling him the “uncrowned champion.” In 1941 he defeated Overlin for the NYSAC title (W 15). Following three non-title bouts, he relinquished the crown to campaign as a light heavyweight. 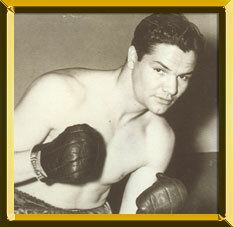 He retired in 1942 following a loss to Jimmy Bivins (L 10) with a record of 34-6-1 (13 KOs). Soose, who served in the U.S. Navy from January 1942 until October 1945, died in Honesdale, PA on September 5, 1998 at the age of 83.